In August 1960, a Soviet colonel called Oleg Penkovsky tried to make contact with the West. His first attempt was to approach two American students in Moscow. He handed them a bulky envelope and pleaded with them to deliver it to the American embassy. Inside was an offer to work as a 'soldier-warrior' for the free world. MI6 and the CIA ran Penkovsky jointly, in an operation that ran through the showdown over Berlin and the Cuban Missile Crisis. He provided crucial intelligence, including photographs of rocket manuals that helped Kennedy end the Cuba crisis and avert a war. Codenamed HERO, Penkovsky is widely seen as the most important spy of the Cold War, and the CIA-MI6 operation, run as the world stood on the brink of nuclear destruction, has never been bettered. But how exactly did the Russians detect Penkovsky, and why did they let him continue his contact with his handlers for months afterwards? Could it be that the whole Cuban Missile Crisis was part of a Soviet deception operation - and has another betrayal hidden in plain sight all these years? 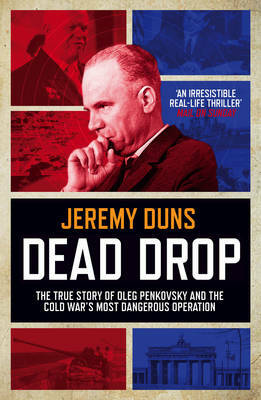 Thrilling, evocative and hugely controversial, Dead Drop blows apart the myths surrounding one of the Cold War's greatest spy operations.